Show your adventures to everyone! 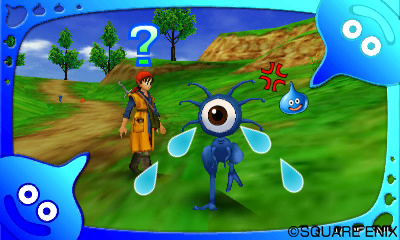 If you're planning on picking up the upcoming Dragon Quest VIII once it makes its way to 3DS in the States, you might want to check out this awesome new feature! You can take your own special photos in Camera Modes and dress them up with frames, stamps, and other items. You can even change the clothes and costumes of the characters in the shot so you can make cooler arrangements. Once you're satisfied with how the photos look, you can head into StreetPass to share them with friends. You can send your special creations by way of "postcards" that can even be evaluated by passersby. They can receive ratings in this way as well. This adds an interesting social element to a game that's being ported to handheld devices, and should be a boon for people who are interested in sharing their exploits with friends. I'm particularly interested in stamping Slimes all over everything.